A half mile from our house, there is a row of lakefront homes. A small sliver of land between two of the behemoths serves as a public access point to the lake. Last week, an hour before the sun tucked itself in for the night, we pushed our strollers through the skinny green passageway to enjoy the pint-sized plot of beach that was ours. It wasn’t long before Lucy began wading in the water, delighted by the sand squishing between her toes. She was wearing last year’s Halloween costume — a pink and yellow princess dress — because, well…just because. The gentle waves kissed the bottom of her gown. I considered telling her to be careful not to ruin it, but reasoned that a little water never hurt anyone. Meanwhile, Ben was outfitted in his Incredible Hulk costume — you know, just because —and was lying face-down in the sand like a big green turtle who had come in with the tide to build a nest. We’d be finding sand on him days later. By the time I turned my attention back to Lucy, she was in lake water up to her armpits, sparkly princess dress and all! I stood there, in stunned silence, as the supercomputer in my brain whizzed through its vast database in search of some rule frowning upon the intermingling of lakes and princess dresses. The warm smile that beamed widely across her face suggested that perhaps this was yet another rule that doesn’t exist. In that moment, Lucy was unquestionably living life as well as it can be lived. Too often, we fall far short of this ideal. Why? Because we’re afraid of getting our princess dress wet. Our “princess dress” is the carefully-curated version of ourself that we show off to others. It’s the way we look, speak, and act. It’s our degree and our job title, our home and hairstyle, our cars, clothes, and 401ks, all wrapped into one pretty package and tied with a bow that signifies that we are responsible, sophisticated, and successful. In order to keep this princess dress looking good, we must live a life of restraint. No full-out running, no sitting on the ground, no eating messy things, and certainly no swimming in lakes. We are given countless opportunities to dive headfirst in to the experience of life, but we are too afraid to mess up our hair, our clothes, or our reputation. Because running through puddles, making a mess, or doing something silly for sheer sake of fun sullies the dress we’ve worked so hard to preserve. While settling for good enough, we miss the insanely great. Guess what? After the dip in the lake, Lucy’s princess dress went into the washing machine and came out good as new. Don’t settle for dipping your toes into this adventure called life. For best results, spend more of your time up to your armpits in awesome. 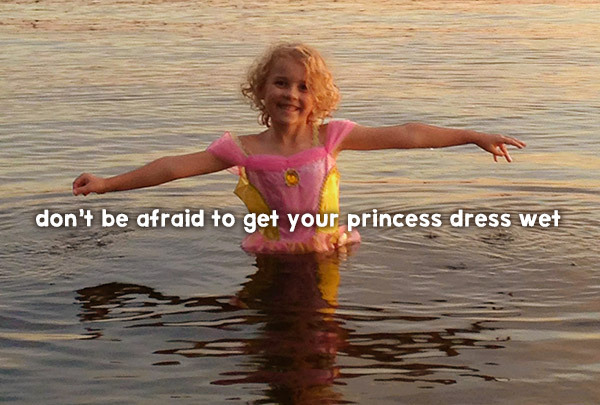 Don’t be afraid to get your princess dress wet. Mine isn’t recent, but similar. When our three boys were young, ages 3-5, our family went to Florida for vacation, while visiting some friends for the the day, we went to the beach to view the sunset, unfortunately, it was quite chilly and we neglected to bring our swimsuits. Of course three boys, water and sand make a great mixture; the waves were lapping our feet, then up to shorts, they were frantically trying to hike their clothing higher & higher to keep from getting wet, the mom in me was wondering how to travel back an hour w/ three sandy mites, then it all fell away…who cares?! We had blankets in the car, we could stash the wet clothes in a bag, this moment would never happen again; when we said, “go for it”, the look on their faces was priceless. They ran up & down the beach in the waves while we watched the most glorious sunset over the Gulf of Mexico. I love the picture of Princess Lucy of the Lake! My 3-year-old grandson, Josiyah the Superhero, just got new Batman light-up shoes and Spiderman rain boots. Of course, when it rained recently, he wanted to test his rain boots. At first, we were all “No, it’s raining, we can’t go outside,” but then I went through my supercomputer brain and realized that it’s summertime, it was 80 degrees outside, no thunder or lightning…what’s our problem. Of course, let’s test out those rain boots! So Josiyah & I put on our rain boots (I wore winter boots – a bit toasty in 80 degrees! ), grabbed umbrellas – only because he has a really cool dragon umbrella with a sword hilt handle – and went splashing through the rain. Great fun…and a wonderful memory! Lucy is adorable ! Just love this picture ~ so fresh, so free and so much fun! Thanks Wanda! She’s a gem alright! One of the most priceless, beautiful senior pictures was of our niece is her prom dress; standing out in a lake with the skirt of her full dress floating all around her. The sun was setting and glinting off the water; it was awesome. At first when she mentioned it, I thought she was crazy and going to ruin her dress. But do they ever wear them again! Wow, that sounds awesome, Pam! Sounds like your niece is quite the rebel. I which I’d had the courage to do something like that when I was senior! Ah, a great use of idle, time, Rhonda!